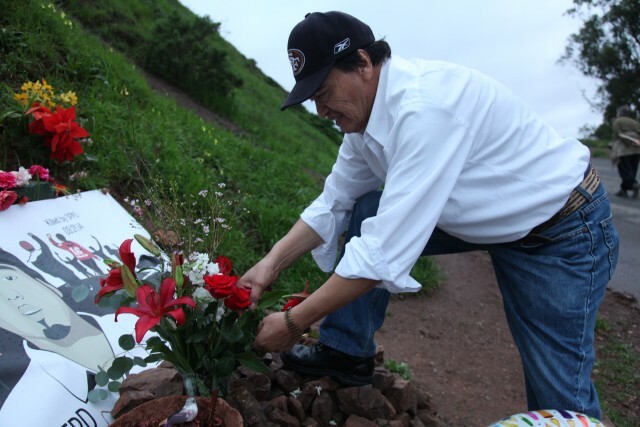 Refugio Nieto, Alex Nieto’s father, trimming flowers at his memorial on Bernal Hill after the trial Friday. Nieto would have turned 30 that day. Photo by Joe Rivano Barros. The only eyewitness to the March 2014 shooting of Alex Nieto by four San Francisco police officers — whose account differs widely from that of the police — testified Friday when cross examined by the defense that his heavy drinking impacts his ability to recall specific details. Antonio Theodore, a singer with the band Afrolicious, told jurors on Thursday that he was walking his dog in Bernal Heights Park the night Nieto was killed and watched the shooting from 115 feet away, testifying Nieto never took his hands out of his pockets and never shouted anything at officers. All four officers took the stand this week and said they shot Nieto because he was aiming a gun at them. Theodore also said on Friday that the shooting occurred dozens of yards away from where the officers said it did. Theodore also testified that just one patrol car was near Nieto when he was shot, not two as officers have testified. But under questioning by the city attorney representing the officers, Theodore admitted to drinking heavily and having trouble with his memory. Theodore testified he “cannot exactly pinpoint days and times” as Baumgartner asked him to recount events from just after the shooting to when he decided to come forward with his version of events. Theodore waited more than a year to offer his testimony because he said he feels “threatened” by officers and did not trust them to believe his account. Nieto’s parents are suing the city of San Francisco in U.S. District Court for financial damages, alleging that four San Francisco police officers — Richard Schiff, Jason Stewart, Roger Morse, and Nathan Chew — caused the wrongful death of Nieto and violated his civil rights. On the night of March 21, 2014, a man called 911 to report someone armed with a gun at Bernal Heights Park. Minutes later, two police officers — Schiff and Stewart — arrived at the park, drove around an entrance, and continued up along a paved road into the park. The pair stopped some 30 yards from Nieto and exited their vehicle, testifying earlier this week that they shouted for Nieto to show his hands, and began firing after he shouted back “No, show me your hands” and drew a weapon. The other two officers arrived after Nieto was already on the ground and testified that they started shooting because he was still aiming his weapon. Nieto carried a taser for his job as a security guard, and the lead homicide detective for the case testified Thursday that the taser’s coils were protruding when he arrived on scene, indicating it had been fired. Adante Pointer, the attorney for the Nieto family, said outside the courthouse on Friday that Theodore’s testimony did contradict physical evidence presented in court but pointed out that the police department is in charge of such evidence. “Who controlled the physical evidence?” Pointer asked. If Theodore’s testimony is accurate, it would mean a major cover-up at the hands of the police department. Not only would all four officers and expert witnesses from the department be committing perjury, but police personnel on scene the day of the shooting would have had to move Nieto’s body and other physical evidence dozens of yards uphill — or lie about its location afterwards. Also testifying Friday was Amy Hart, a pathologist with the Medical Examiner’s Office, who recounted in detail some of the 14 gunshot wounds found on Nieto’s body. Nieto’s parents, Refugio and Elvira, were noticeably upset during the testimony and left the courtroom before the defense showed pictures of the dead body to the jury. During Hart’s examination, Pointer delved into forensic evidence that might bolster the family’s argument that Nieto had his hands in his pockets when he was killed. A bone fragment that Hart said could belong to Nieto’s left wrist was found in one of his jacket pockets after the shooting, Hart testified, though she also said there was no damage to Nieto’s pockets that might indicate bullet entry. “The million dollar question is how that bone ended up in his pocket,” Pointer said outside the courthouse after trial. Pointer also wanted to know why Hart had not taken pictures of the jacket as she had with other items of clothing from Nieto. “That should be cause for concern for any fair-minded person,” he said after trial. Nieto would have turned 30 years old on Friday, and his family and advocates held a birthday ceremony at his memorial on Bernal Hill after the trial with cake, tequila, and chips and guacamole. Refugio and Elvira trimmed bouquets of flowers and tied birthday balloons to rocks as some two dozen people sang “Feliz cumpleaños” while the sun set. Theodore happened to be walking his dog at the park and stopped by the celebration, saying hello to Nieto’s parents but generally keeping his distance. He said he worries constantly that the police will retaliate against him for his testimony and that he is alternatively furious and sad at what he saw that day.